צד אחד Effigy of Queen Elizabeth II and the words "Elizabeth II D.G. Regina Reg Fid 25 Pounds"
הפוך תמונה מעוצבת של גריפין עם כנפיו מופשטים ומחזיק את המגן של אדוארד השלישי והמילים "Griffin of Edward III 1/4 oz Fine Gold 9999 2017"
תמונה מעוצבת של גריפין עם כנפיו מופשטים ומחזיק את המגן של אדוארד השלישי והמילים "Griffin of Edward III 1/4 oz Fine Gold 9999 2017"
מטבע זהב Royal Mint חיות המלכה | הגריפין של המלך Edward השני משנת 2017 משקל רבע אונקיה Order the spectacular 1/4 oz 2017 Griffin gold coin at the lowest price online, second in the Queen's Beasts series issued by Britain's Royal Mint. 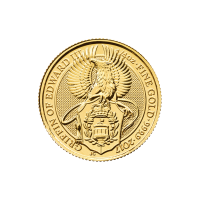 The coin features a griffin, which Edward III had engraved on his private seal. Queen Elizabeth II's coronation in 1953 was watched over by 10 heraldic beasts, created to represent the various branches of royal genealogy over the centuries. The griffin is thought to be a symbol of strength, guardianship and vigilance, and is holding the shield of Edward III. The shield displays the Round Tower of Windsor Castle, where Edward was born. The shield is surrounded by oak branches with the royal crown above. Unusually, both sides were executed by Jody Clark, an engraver at the Royal Mint. His effigy of the Queen is the only fifth to have graced British coins since 1953.